Flooring Specialists in Hatfield. Covering Hatfield and all surrounding areas within 20 miles. David Charles Flooring are an independent flooring specialist with over 20 years experience providing solutions to every type of laminate and wooden flooring scenario in domestic and commercial settings. Based in Hatfield (Herts), we serve Hatfield and all surrounding areas within 20 miles. At David Charles Flooring, our highly skilled installers have vast expertise with all types of flooring be it solid wood, engineered wood or laminate flooring. In addition to new installations we also offer a comprehensive range of bespoke flooring services such as fitting only and insurance work. We are also able to perform all kinds of repair work to any existing floors. In fact whatever your flooring needs, David Charles Flooring are the perfect choice! If its an impressive finish that is required then a real wood flooring installation from David Charles Flooring is the answer. When installed by craftsmen such as ourselves, the new floor will transform your home adding genuine warmth and value. We offer a huge range of styles and colours to suit your requirements and are happy to show you our exciting samples to help you make your decision. Laminate Flooring is an excellent cost-effective and versatile alternative to a real wood floor. Installation is often attempted as a DIY project and the finish sometimes suffers as a result. There really is no substitute for an expert laminate flooring fitter to really get the best out of the product and show it at its absolute best. This is where David Charles Flooring come in! Our expert fitters will do an impeccable job, with no fuss and in a fraction of the time. If you are looking for something to brighten up a room in your home then white laminate flooring is the perfect choice. There are many different varieties, with various shades and lots of different patterns and effects available, even the direction of the way the floor is laid can have a dramatic effect on the feel of a room. White laminate flooring is chosen by those looking to add purity and elegance to their home and it also makes the room much brighter and seem more spacious. Please visit our website for further comprehensive information. "Wonderfully polite, was very quickly available and did a proper job at a good price. Even went above and beyond by sourcing extras that I had forgotten to buy such as the bar and beading. Would definitely recommend and use again!" "Can highly recommend! David went above and beyond with the work he did for us. It was a big job and we came across quite a few unforeseen issues - David had a plan to overcome them all. He is totally professional and works to an incredibly high standard. He was friendly and a pleasure to have in our home. I would not hesitate recommending David to anyone. We are so pleased with the look and finish of our new floors! Absolutely brilliant job!" 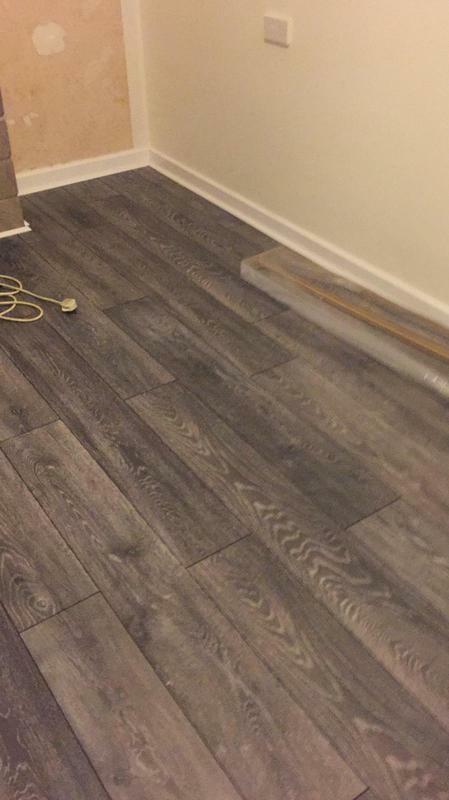 "David is excellent at flooring his knowledge and can do attitude is so pleasant. He would talk through solution for a few tricky parts of our project and worked with me until a satisfactory resolution was achieved. He is a perfectionist who will not be happy until work is carried out to his high standard. It was lovely to have him in our home and he was very caring around my dad which is very appreciated. I would recommend him over and over again. He is a great guy who exceptional at his job. Perfect!"